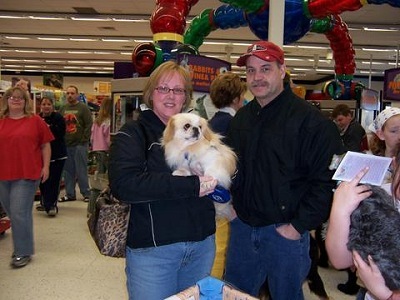 Peke A Tzu Rescue was invited to attend Petco's 's National Adoption Day Park and Bark and Meow Event in Muskegon, Michigan. Our volunteers Marianne, Val and Val's son, Diego participated. 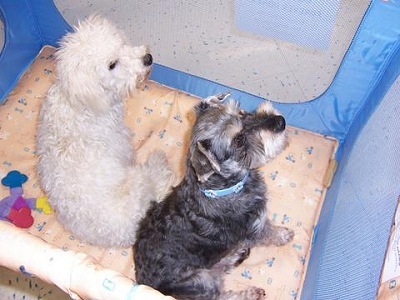 Val brought fosters, Desi the Bichon and Megan the Schnauzer. When our volunteers arrived, tables were set up and had tablecloths on them. At each table was a fishbowl for donations. 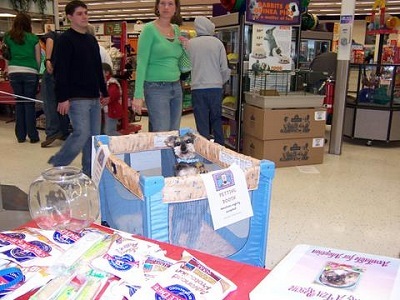 Also on the table were several sample packets of dog food, tartar control chew bones, etc. 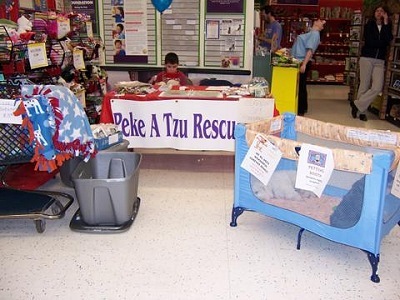 Each table sold them for $0.25 and got to keep the money for their rescue. 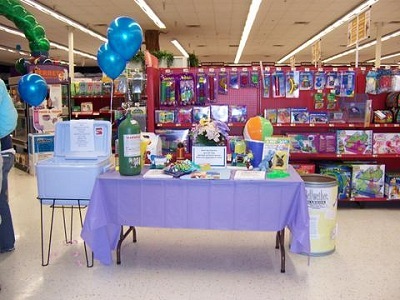 Petco had balloons at the front door, they had a popcorn machine and charged $1.00 per bag and donated all the proceeds to pet rescue. 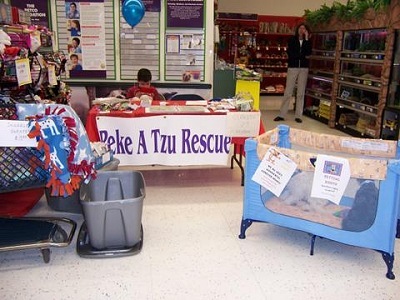 Petco had little bags of goodies at the front door that people could buy for their pupsters and donated that money as well to pet rescue! 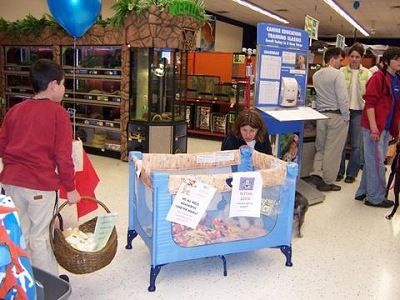 Petco advertised on local radio stations so there was a huge turnout! We never had a lull in the action! 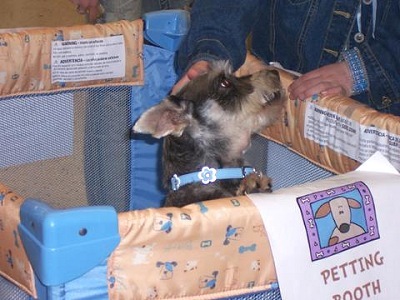 Petco donated Petco coupon books that have a $350 value to hand out to new adopting families. 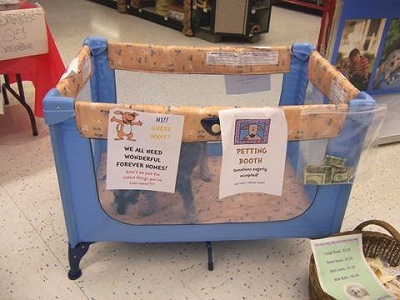 Petco also generously donated some free grooming coupons for new adopters. 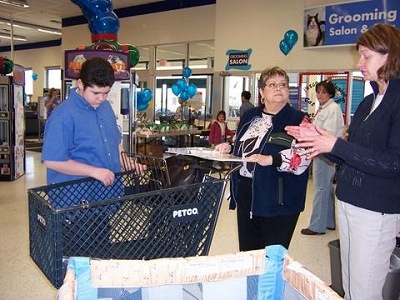 Petco had a fantastic drawing for $1000 to be donated to a local rescue or shelter. We entered PATR into the drawing and have all pupsters paws crossed hoping we will win the drawing to be held later next week! 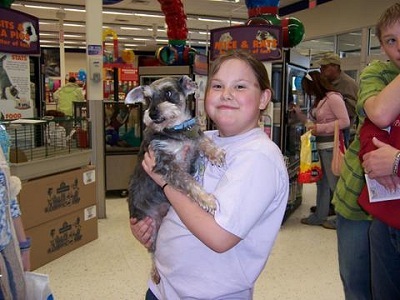 Desi and Megan received tons of attention and there were so many wonderful families interested in our fosters. Megan is such a love bug and sweet little girl. Desi was also a hit and he too is just a sweetheart. They were both troopers and by the end of the day, Desi was exhausted and sound asleep. Val's son, Diego, was put him to work greeting customers and selling special soaps to raise funds for our vetting expenses. Thank you, Diego! 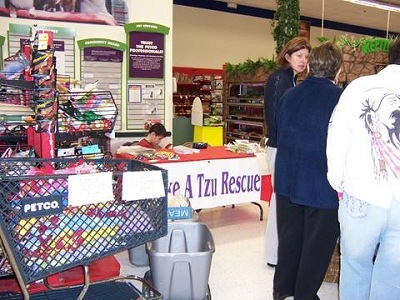 Val was relentless and told everyone all about the rescue and our babies! Dugan, who went to his forever home last Sunday, paid us a visit. He is doing well and his new mom Pam has him brushed so beautifully. Dugan is being such a good boy in his new home and not marking. However; today at Petco, Dugan marched right over to one of our tubs that we tote things in, and lifted his leg and piddled! I think that was his way of saying, "Don't forget about me!" 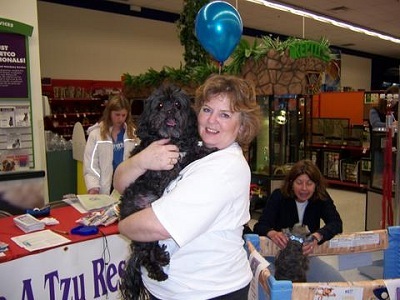 And foster Snoopy the Peke and Poodle mix, came to visit us with his foster mom, Vicki. 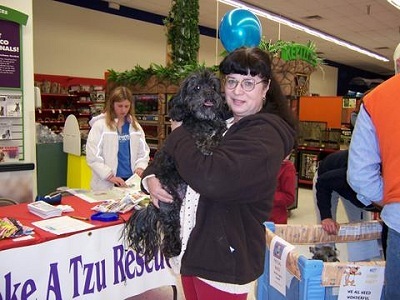 Vicki also fosters Zoya the Poodle and Bandit the Shih Tzu. Marianne, who sponsors Snoopy, had never met Snoopy in person and fell in love with him! Our Snoopy is a special special boy! Marianne could not get enough cuddles and kisses from Snoopy and this just made her day! 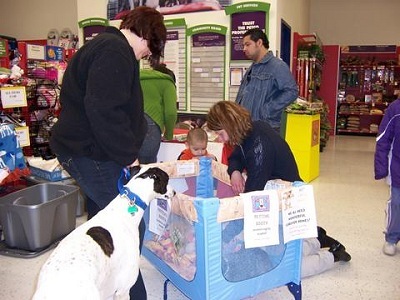 Our special thanks to Petco for including us in the National Adoption Day and to our wonderful volunteers, Marianne, Val and Diego. Also, thanks to Pam and Dan for visiting with Dugan and Vicki for visiting with Snoopy.